Can you confirm these amateur observations of Holbrookia propinqua? Type locality: Between Indianola and San Antonio, Texas. Restricted to 9 miles southwest of Somerset, Atascosa County, by SMITH & TAYLOR 1950.
piperata: Type locality: Mexico: Etiopa, 2 mi S of Tecolutla, Veracruz. 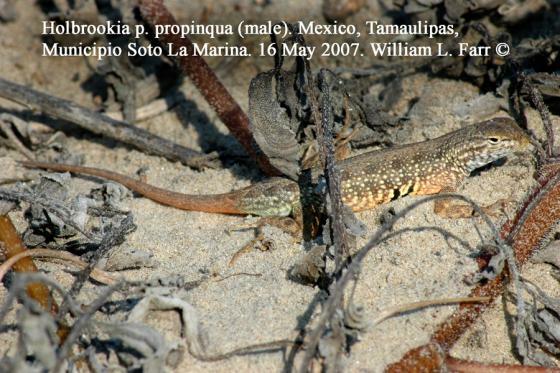 propinqua: S Texas, Mexico (Tamaulipas); Type locality: Between Indianola and San Antonio, Texas. stonei: Texas; Type locality: Padre Island, Texas. Types Lectotype: USNM 2671, desgnation by Axtell 1981: 211. Given as “unknown” by SMITH & TAYLOR 1950: 85. Comment H. p. stonei is not listed by CROTHER (2000), nor Liner 2007. Schulte & DE QUEIROZ (2008) showed that Holbrookia maculata is shown to be paraphyletic with respect to Holbrookia propinqua. Bartlett, R. D. & Bartlett, P. 1999. A Field Guide to Texas Reptiles and Amphibians. Gulf Publishing Co., Houston, Texas, 331 pp.